Home » What is media blasting? A media blaster propels abrasive media from an air powered media blast gun. If you would like an in depth review on how the blasting process works, read this post “what is sandblasting“. That post discusses how the “blasting” process actually works. For now, we will focus on the term media blasting. As a result, we hope that if you are searching for a media blaster for sale, or just are curious, that this information helps you. A search on the Internet for “media blaster” or “sandblast cabinet” gives you a lot of information. First, when we think about “what is a media blaster” we focus on is the word “media”. Most noteworthy, media blasting is basically the same thing as sandblasting. Above all, the name simply means what is being sent out the blast gun. 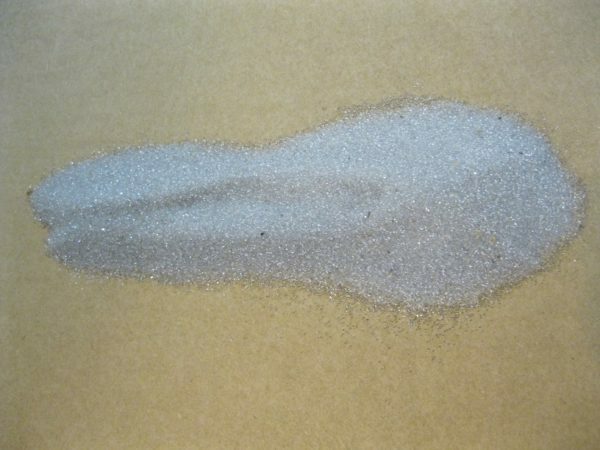 Therefore, bead blasting is commonly used when blasting with glass bead media. Shot blasting is another example when using steel shot media. Finally, the generic term “media blasting” can refer to any type of abrasive media. What is a media blast cabinet? Cyclone offers many sizes of media blasters, including our small media blaster (the BT-20) all the way up to our industrial media blaster line up. In this discussion, we are going to focus on media blast cabinets. Certainly, there are other ways to blast without a cabinet. But we just want to keep the discussion focused and easy to follow. As you know by now, the cabinet has a few names: sandblast cabinet, bead or abrasive blast cabinet. Notice anything? That’s right, the cabinet stays the same, only the media is changing. Consequently, the simplest answer to “what is a media blaster” is simply a blast gun that pushes out some type of abrasive media. 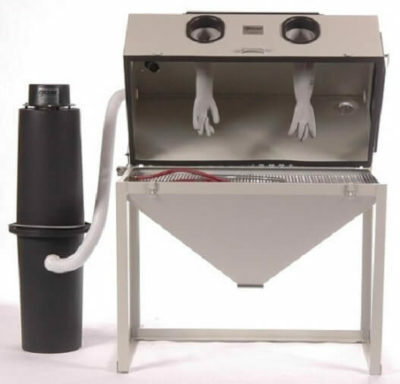 There is a variety of blasting media that can be used in a media blast cabinet. Furthermore, choosing which type can be difficult. Therefore, understanding the safety of each variety is also very important. Above all else, we do not recommend (never have) the use of sand in a media blast cabinet. Finally, to learn about the dangers of silica sand and silicosis click here to read here about the dangers. Cyclone offers safer alternatives to sand. First, always read the appropriate material safety data sheets for your abrasive media. Next, always read, follow, and understand all warnings and instructions. No media blasting is 100% safe. Above all else, you always have the ultimate responsibility for your own safety and understanding the risks. 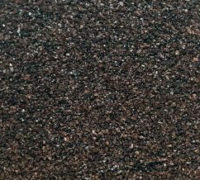 Each type of abrasive media has unique characteristics. Read all about that here. 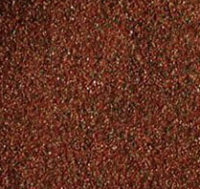 There is glass media, garnet blast media, and aluminum oxide blasting media. You can use steel blasting media or coal slag media too! Additional media types are corn cob, walnut shell, and silicon carbide. Earlier we mentioned our emphasis on media blasting cabinets. It is worth reviewing some important aspects of high quality cabinets. First, a good cabinet will be constructed of a solid material. Steel is a great choice because it is sturdy, lasts an incredibly long time, and is extremely durable. Next, look for good legs welded to the cabinet. Media blasting cabinets have to support the weight of the cabinet, the parts inside, and the abrasive media. As a result, legs that are unsteady will wobble. As a result, it can be dangerous and frustrating to the person doing the work. 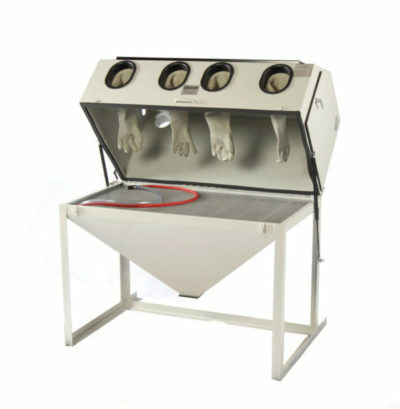 Other important characteristics of a quality media blasting cabinet include view window protection, comfortable media blaster gloves, sealing to prevent leaks, and a powerful media blaster gun. As a result, these characteristics will give the user a great blasting experience. Consequently, all Cyclone media blasters come equipped with these items and more. As you search for media blasters for sale, look for a good seal inside the cabinet. This is because sealing the cabinet ensures that dust and debris does not exit the cabinet. Abrasive dust and debris is a serious health hazard and safety risk. Additionally, inhalation of dust and slippery media on the floor can seriously injure or kill. Due to those risks, read a little more on abrasive blasting safety here. Finally, trust our Cyclone cabinets to not leak. Whether you call it a sand blaster or media blaster, sandblast cabinet, or as we do here “media blaster” you are talking about the same thing. Basically, once attached to an air compressor, a media blaster gun produces a powerful flow of abrasive to clean a surface or remove debris. As a result, some people use them for etching glass and stone. Additionally, these machines are used to media blast a car or car parts. Overall, they are perfect for Automotive shops and beyond. Certainly, DIY pros also make efficient use of media blast cabinets to remove rust, scale, and peen metal. 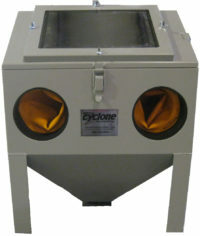 Cyclone proudly offers high quality media blasting equipment and supplies at affordable pricing. As a result, our team will help you before and after a sale with questions you may have. Cyclone team members are part of our local community and we proudly label our products Made in the USA. 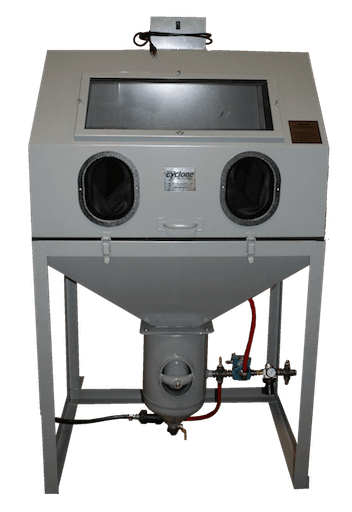 Finally, we have a year end rebate of $150 available on our model 4040 media blasting cabinet through 12/31/2018. Call or email today. We never spam or clutter your inbox with junk. Our team will only mail you when we have specials, deals, and news. It’s a one-click unsubscribe too.